There are many common misconceptions when it comes to mold in a living space. Arguably the biggest one being that you can completely rid your living space of mold. Mold spores travel through the air attaching to your shoes, clothes, hair, or they simply blow into the house if you have the windows open or by opening the door. Some leaks you just simply cannot see. If the leaks go on long enough and depending on where the leak is, you can have mold in the parts of your home you cannot see. With that being said, there will always be some amount of mold inside your home. The second biggest misconception is using bleach to clean an affected area. I have spoken slightly about the issue with bleach in a previous post, but I will reiterate why you should not use bleach. First, using bleach does not kill all the mold spores in porous areas like drywall and/or wood. In fact, if you do not have proper air flow in the area you could put an even bigger risk on your health with the protentional of producing toxic gas (mixing bleach and ammonia). What do we recommend? For small DIY mold problems, we recommend putting antimicrobial dish soap on a wet rag and wiping the affected area. The last misconception I will speak about is that all Black Mold is the worst mold to have. There are thousands of different molds! Some molds are green, purple, red, blue, white and the dreaded black. 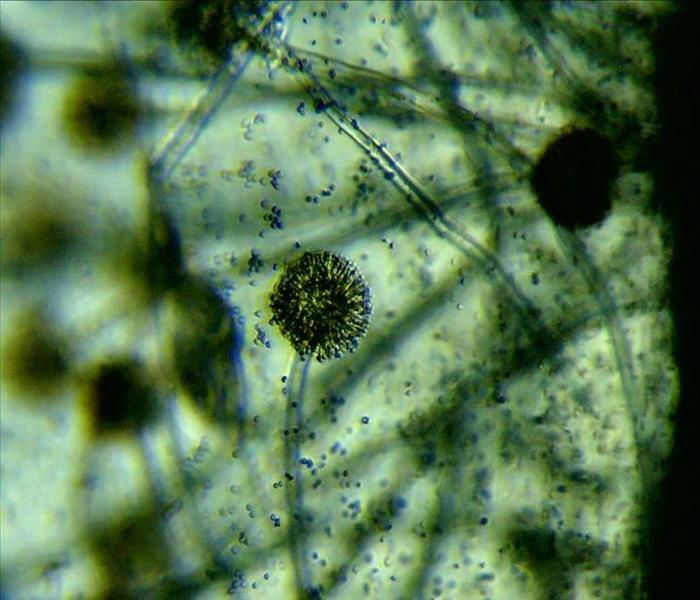 The name of the mold that is feared to be the one and only Black Mold is called Stachybotrys. Therefore, it is important to have a professional come out and do mold testing, so we know, and you know what mold is present in the home. If you have any questions or concerns, please do not hesitate to call! We would be more than willing to answer your questions or concerns! Power strips are one of the best things you can have in your home. They also can be potential hazards. A home in Glendale fell victim to a power strip fire. Thankfully the homeowner was home and was able to put out the small fire on their own (fire extinguishers are amazing for small fires). The homeowner then turned the power off to that side of the home. Eventually, the power strip was unplugged to discover why the fire started in the first place. When the homeowner was doing a water change for their fish tank, they did not realize some water spilled and made its way towards the power strip (that was some distance away). The homeowner stated that they have had that fish tank in that exact spot for close to 5 years and never had an issue until now. Sometimes freak accidents happen, are you prepared? If you do not feel you are prepared, we can help! If your water bill spikes for no apparent reason you should probably call a plumber out before the damage becomes worse. If there is no probable cause like a dripping faucet, running toilet, or a teenager who took an hour-long shower, you might have a leak that is underground, behind a wall, or anywhere you cannot detect. Not only will a leak spike your water bill it can also do severe damage to your home. If the leak is being a wall you are guaranteed to have mold, if it is under your home you will most likely have foundation issues if the leak persists. Either way having peace of mind is always better. Would you rather pay a plumber to tell you nothing is wrong, or wait until something becomes a major problem and pay then? I am not saying if your bill goes up 5 dollars to call a plumber out every time but if it goes up a substantially noticeable amount. The picture shown is one of the many times we have worked on a "slab leak." Slab leak in everyday terms is a leak under the house that is coming through the concrete causing damage to the home. We are here for you 24/7 and we are always willing to answer any/all questions. We are often asked, "What is the difference between Residential and Commercial restoration?" Although there are a lot of difference, there are also a lot of similarities. The biggest difference is the size of the properties. Commercial buildings can be the same size of a decent size home or they could be thousands of square feet. The bigger the size the more equipment/materials required. Another major difference is the requirements. One of the requirements is being asbestos tested. If a building is deemed "commercial" it is required to have asbestos testing (apartment complexes with 5 or more units, office buildings, condos, warehouses, etc.). While in a residential home if it is older than 1981 it is required to be asbestos tested. We treat every job like it is our home, or our office and treat every customer with respect and care. If you have any questions about our commercial services do not hesitate to call! Restoring a commercial property has different standards than restoring a residential home. The quality of the work does not change we just simply need to do more work. What sort of work? The biggest difference is that it is mandatory to do asbestos testing. For a residential home we only have to do asbestos testing if the home was built before 1980. While commercial needs to be asbestos tested no matter what year the complex was built. Why? Commercial materials can be stored in warehouses for who knows how long until they are finally used. This poses a risk not only for us but for everyone in the office/apartments/condos. What is asbestos? Asbestos is a natural material (rock) that is used with materials such as cloth, paper, cement, and plastic that is great for insulation. Asbestos became popular in the 1940’s and was used heavily in buildings until the 1980’s. Now it is required that products in the United States contain less than 1% of asbestos. Why is asbestos so dangerous? It causes Mesothelioma. That is why it is taken so seriously by restoration companies and reconstruction companies. To start this blog off I will say that no one was seriously injured in this fire. The only damage done was to this single apartment which everyone one involved is lucky and thankful. Now let us get into what happened and how we helped with the cleanup of the apartment. The source was believed to be from an electrical wire that sparked for on reason or another causing the fire. The first responders did an amazing job (as usual) of putting the fire out and making sure no one was injured. How did we help? We removed all the effected content and sorted it between salvageable or unsalvageable. Unfortunately, almost everything in the apartment was unsalvageable but thankfully the tenant had insurance to cover their belongings. By no means does that mean it is easier going through any loss, but it can give you a slight relief knowing you are covered. With the contents that were salvageable we will be cleaning them and getting them back to preloss conditions. SERVPRO of Paradise Valley has done work for numerous amounts of commercial buildings. We have done carpet cleanings, water removal, mold removal, fire restoration, biohazard, and anything we would do at a residential property. No matter how big or small we are always prepared. One of the ways we are always prepared is having SERVPRO Storm. This division of SERVPRO is made up of highly experienced personal in case of a natural disaster, or a large loss that franchises normally do not see. One example would be if there was a fire in a hotel or apartment that damaged more than 300 rooms. SERVPRO Storm gives SERVPRO franchises peace of mind knowing if they ever need help, it is just one phone call away. If you are currently watching the news you have probably seen SERVPRO Storm in states affected by Hurricane Michael. The general "rule of thumb" for mold beginning to grow is 24-48 hours. With that being said there are a lot of other factors that can play into this. One of which being how humid the area is. If the area that is affected has a small amount humidity it most likely will have less mold growth than a place that has a lot of humidity. Just because you cannot see it does not mean it isn't there, but if you see it here are some tips on what to do. If you see visible signs of mold in your home in most cases, you can easily clean it off. Some of those few cases would be if it is on tile/grout, on metal or plastic tubing (toilet supply lines), and on concrete. However, bleach should NOT be used. Your safer bet would to be used dawn dish soap. Note, you should only wipe the mold away it is a small amount, if it is large scale you are going to have an even bigger problem on your hands. You should always find the source of the problem when discovering mold, if you cannot find the problem you should hire a professional, so you do not have a reoccurring problem. Mold is not a major problem at small quantities, however, not knowing the source and having a reoccurring problem can be a major problem in the long run. Contact SERVPRO of Paradise Valley for mold remediation services.